The POSM Horse is an ancient animal. 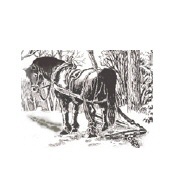 Associates of the not for profit American POSM Horse Association ( A POSM HA ) are a dedicated few individuals who seek to breed this God gifted animal for responsible primary work on small family farms, homesteads, ranches, in the woods and on the roads. Though we do not all make our living entirely from such lofty goals, we are agreed as to the type and that includes the POSM Horse must be capable of primary work. After all, that is what made Figure a standout. Those who own POSMs celebrate their small size; good mind; willingness to work; gentleness with children and the elderly; stamina; hardiness; longevity; soundness; etc.. We use the POSM Horse Registry to perpetuate the best POSMs we can breed. We are not about experimentation with an animal whose worth has been proven by people who used him to earn a living from the soil and its directly associated endeavors. It is not intended as a status symbol, but as a tool. As strange as it may sound, in our present time of plenty and leisure, this Association is about giving something back. It's about preserving and perpetuating a noble little horse. Future generations, with God's blessing of simple living by stewardship of the land through localy based family craft farming within our own neighborhoods, may have need of such a proven animal partner once again.